Goodreads says, "Charlie Grant’s older sister is getting married this weekend at their family home, and Charlie can’t wait—for the first time in years, all four of her older siblings will be under one roof. Charlie is desperate for one last perfect weekend, before the house is sold and everything changes. The house will be filled with jokes and games and laughs again. Making decisions about things like what college to attend and reuniting with longstanding crush Jesse Foster—all that can wait. She wants to focus on making the weekend perfect. The only problem? The weekend is shaping up to be an absolute disaster. There’s the unexpected dog with a penchant for howling, house alarm that won’t stop going off, and a papergirl with a grudge. There are the relatives who aren’t speaking, the (awful) girl her favorite brother brought home unannounced, and a missing tuxedo. Not to mention the neighbor who seems to be bent on sabotage and a storm that is bent on drenching everything. The justice of the peace is missing. The band will only play covers. The guests are all crazy. And the wedding planner’s nephew is unexpectedly, distractingly…cute. Over the course of three ridiculously chaotic days, Charlie will learn more than she ever expected about the family she thought she knew by heart. And she’ll realize that sometimes, trying to keep everything like it was in the past means missing out on the future." Charlie Grant is the youngest of the five Grant siblings and she is the last of her siblings to live at home. She is headed off to the local university in the fall, but meanwhile, she has her older sister, Linnie's, wedding to host at her family's home. Charlie is so excited to have all of her siblings at home under one roof and to top it off, her mother's famous comic is coming to an end, which is attracting a lot of media attention as it has made her family well known over the years. After all, the comic is based on the Grants' family life! But things start to go downhill as planning a wedding can often become, well, crazy. First, the house alarm starts to malfunction, then there's annoying family members that come to stay, the wedding planner ghosts them, and much more hilarious and also disastrous events ensue. Reading Save the Date was like watching one of my favorite rom-coms. It was the perfect summer read! Charlie is the type of character that I instantly warmed up to in Save the Date. She loves her family and is excited for her big sister's wedding. She just wants to have fun with all of her siblings who have come home again, but things never go smoothly, especially when it comes to a family wedding, right? To top it off she finds out that one of her brothers is staying with her longtime crush, which also complicates matters. Plus, Charlie is also at a crossroads in her life. She is coming up on graduation and heading off to college at the local university her father teaches at. Then she finds out that her parents want to sell the family house, so this also is yet again another big change coming up for Charlie. What I like about the Grants is the fact that they aren't perfect in Save the Date. I could really identify with their issues as well as the fierce love towards one another. Their family life isn't perfect and they have some secrets just like any family. You know that weddings always bring out some of these familial issues! And, oh, the comedy of errors that ensue! Anything that could go wrong was going to go wrong with the Grants and I think that's true when it comes to planning a wedding. Things can get complicated not to mention throwing in a bunch of family members into the mix. It's always dramatic! 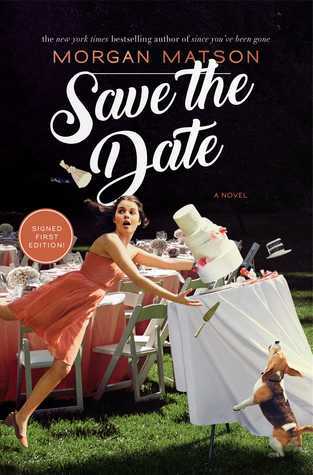 Reading Save the Date was like waking up in the world of my favorite romantic comedy. I loved the Grants and their family wedding; it was a world that I wanted to be lost in. I sure hope they make this book into a movie, because I think it would translate well to the big screen and be so much fun to watch! It reminded me a bit of Father of the Bride. You know when you don't want a book to end? That was Save the Date for me. I can't wait to read this book, it sounds like so much fun! It really is and it was just what I needed on vacation. I hope you get to read it soon. Thanks for visiting, Michele.